This Cabbage Meatballs or vegetarian manchurian meatballs is an Indian-Chinese fusion dish. Vegetable balls fried and tossed in a wok with manchurian sauce/gravy. Yes, this is vegan food. You got to try this meatless balls. Happy cooking! Combine the chopped cabbage, carrots, flour, cornflour, salt and pepper to taste in a bowl. Add water as required (little by little only) and keep on mixing until it becomes sticky and can be formed into balls. Scoop it in equal portion and mold it into balls. You can transfer it into a plate, or scoop, mold and fry it directly into the pan. Fry the balls by batches until golden brown over medium to low heat. Drain from oil and set it aside. In another pan, heat oil and add garlic, ginger, chillies, Green bell pepper, spring onion bulb. Season with salt, black pepper and soy sauce. Add little water to thicken the gravy, then add corn flour. Mix it well to thicken sauce. 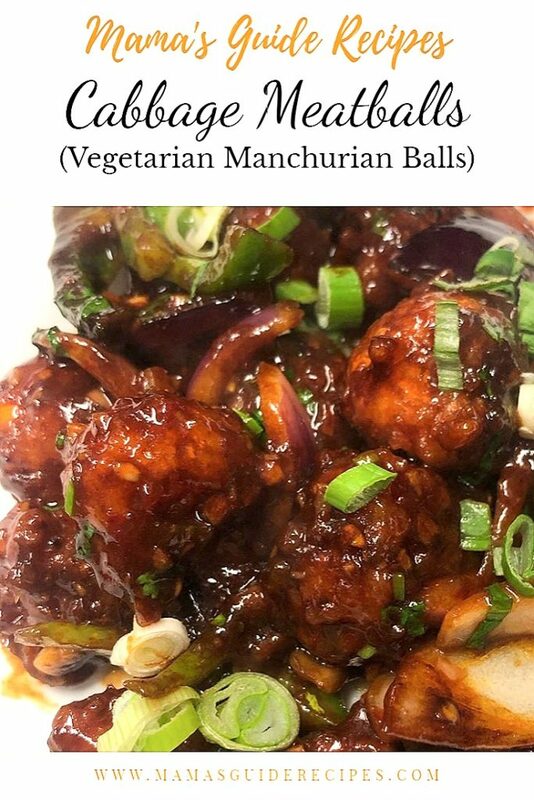 Add the manchurian balls to the gravy and stir it for a while. Garnish with chopped green onions. Serve and enjoy your vegetarian meatballs!